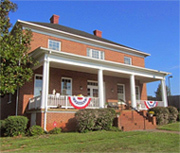 The Franklin County Historical Society holds special events throughout the year in order to draw interest in our area's past. Get yours at the History Museum. It's a scavenger hunt. Visit participating Rocky Mount businesses April 1 - April 13, find the Mason Jar, have an employee initial your find, bring the completed Passport back to the History Museum by 1 p.m. on Saturday, April 13. A completed passport gets you into a drawing for a nifty bucket of moonshine-theme goodies. A partially completed one, gets you a prize - "almost" completed Passports gets you a little bigger prize. MUST BE 21 TO PARTICIPATE. Drawing for the bucket at 2 p.m. on April 13. We'll call the winner. FREE. Thanks to our business partners: Basket Creations, Perfectly Picked, Franklin County Public Library - Main Branch, Julia Beth's, Twin Creeks Distillery, Franklin Glass, Bloomin' Deals, Curves, Harvester, Wood Grains, Kay's Corner, Virginia Office Supply, KupKakery, Virginia Lock & Key, Whole Bean Coffee House, Haywood's Jewelers, Angle Hardware, Flowers by Jones, The Hub Restaurant, Franklin News-Post, Buddy's Barbecue. They've got the Moonshine Jars - get your passport and go find 'em! We're selling tickets! 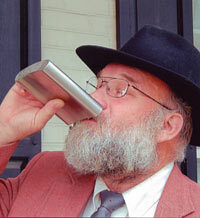 A popular “character event”, Moonshine Express features true tales about the local liquid industry. Actors and interpreters relate factual information about our heritage and events of the not so distant past. Call for departure time - 3:15 available right now. Advance purchase recommended - $15 per person. Ride a vintage tour bus through Rocky Mount - the county seat of the moonshine capital of the world - to see cars of the day, meet people from both sides of the law – and listen as a moonshiner (retired, of course) explains the workings of our full-size replica moonshine likker still. Revenuers (also retired) will talk about what could and did happen to the folks in the illegal likker trade. Visit with legal distillers and hear how they got legal. Thanks to our tourism partners at Commonwealth Coach & Trolley Museum for providing transportation. We’ve got books about the likker trade all year long. Plus our own custom-designed T-shirts (that come in a glass Mason jar), postcards, Cat's Meow Village renditions of our still out back and other gifts for you or others. New T-shirts for 2019 - thanks to PurpleDog Promotions. Thanks to our gracious sponsors for the April 2019 event. Already on board: Henry & Mary Fulcher, Shively Electric Co., CAPPS Home Building Center, Andy Turner Campaign, Cliff & Marsha Fay, Frances Dillon, Town of Rocky Mount, Franklin County Tourism MicroGrant program, Flora Funeral Service, Franklin Dental Associates, Re/Max Mountain to Lake Realty - Julie & Billy Kingery, Carbo, The Hub Restaurant, Flowers by Jones (15th year! ), Davis Heating & Air, Virginia's Old Carolina Road Daughters of American Revolution, Haywood's Jewelers, 220 Auto Sales, Edward Jones Financial - Zach Wimmer, Franklin Finance, Brooks Mill Winery, Crooked Road Family Dentistry, Franklin County Distillers at Boones Mill. If you see them or know them, thank 'em again for us! And we've got room for more sponsors. Just give us a call. Franklin County Historical Society honors Franklin County casualties of all wars and military conflicts each year. Special emphasis is placed on veterans of the War Between the States as this war touched literally every household in the county. This year's date: Saturday, June 8, 2019! We are assisted by Franklin County High School Air Force JROTC, Jubal Early Chapter United Daughters of the Confederacy, Virginia’s Old Carolina Road Chapter National Society Daughters of the American Revolution, area chapters of Sons of the American Revolution and Sons of Confederate Veterans – and representatives of other heritage organizations. The event is free. Features include a guest speaker and firing of a military salute. We encourage the public to join us and show your patriotism. In 2018, former state and national legislator and presidential candidate Virgil H. Goode Jr. delivered rousing patriotic remarks, reminding of our heritage and how important it is to keep history at the forefront in today's challenging times. The 2018 Veterans Memorial Day observance featured a Living History Encampment featuring the 57th VA Co. B re-enactors from New York. We appreciate their annual commitment to this event. 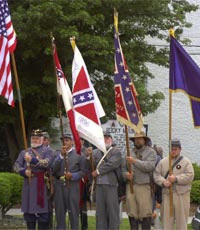 The annual ceremony to remember Confederate veterans buried in the historic High Street Municipal Cemetery, Rocky Mount, will be held Saturday, Dec. 14 at 10 a.m. We now include a Spanish-American War veteran resting here. Re-enactors, men and women in 1700s and 1800s period clothing. A known 26 graves will be marked with holiday greenery gleaned from Franklin County and fashioned into grave sprays by members of Jubal Early Chapter United Daughters of the Confederacy. Descendants and others interested in local patriotism are invited. Following the formal program, we invite everyone to visit the veterans' final resting places - and take a look at other graves which hold many other movers and shakers of our town and county. We celebrated our 50th anniversary with lots of friends! Thanks to everyone who came, who bought tickets and didn't make it (but supported us anyway) and especially to those who bought auction items! Special thanks to Carilion Clinic who helped us secure music by Ernie Power, Jay Shelton, Rodger Doss and Gene Parker! And to those who made donations including Robin Robinson Burke, Bob Camicia, Henry & Mary Fulcher. We appreciate all of the donors of time, money and stuff! And thanks to the folks who donated items for the auctions and the event and helped make it happen: Franklin County Parks & Recreation, Charles & Sarah McDaniel, Franklin County Distillers, Carter's Fine Jewelers, Haywood's Jewelers, Angle Hardware, The Growing Place, Homestead Creamery, Cliff & Marsha Faye, Johnny Bowman, Kenny's Painting, WoodGrains, Cooper Classics, Ruth Meador, The Willard Companies (Westlake Golf Course/Westlake Cinema), Blooming Deals, Brenda Raine, Frances Dillon, Janet Faye West, Doris Eames, Shirley Dent, Martha Hubbard, Lee 'Butch' Eames Jr. - The Wood Doctor, McDonald's, Flowers by Jones, Zach Wimmer, Henry Fulcher, Ann Lewis Edmundson, Bud & Carolyn Blanchard, CAPPS Home Building Center.